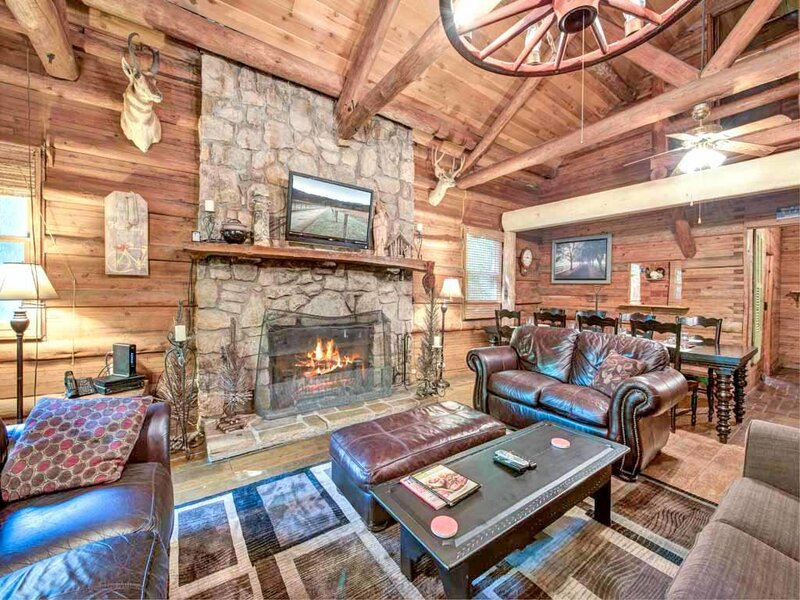 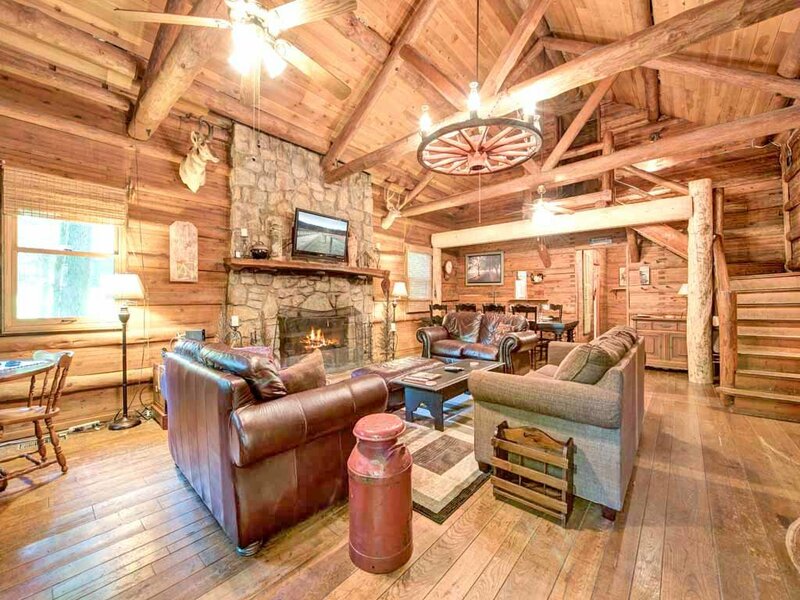 When we say Twin Creeks is a unique mountain cabin, we’re not exaggerating. 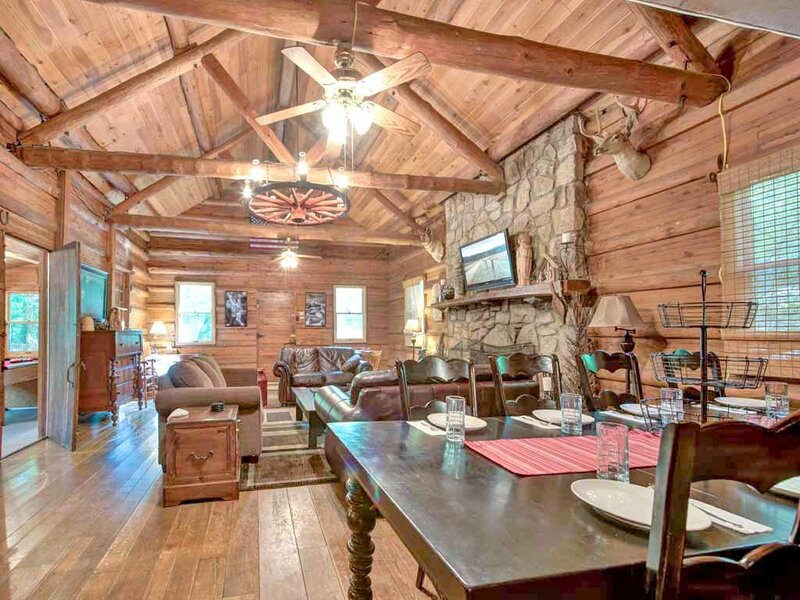 Built by hand in 1937 with a frame of hand-peeled log posts, beams, and tongue-and-groove planks, the nearly 2,300-square-foot home teams rustic charm and traditional craftsmanship with plenty of modern-day conveniences, including a hot tub, a pool table, and free WiFi. 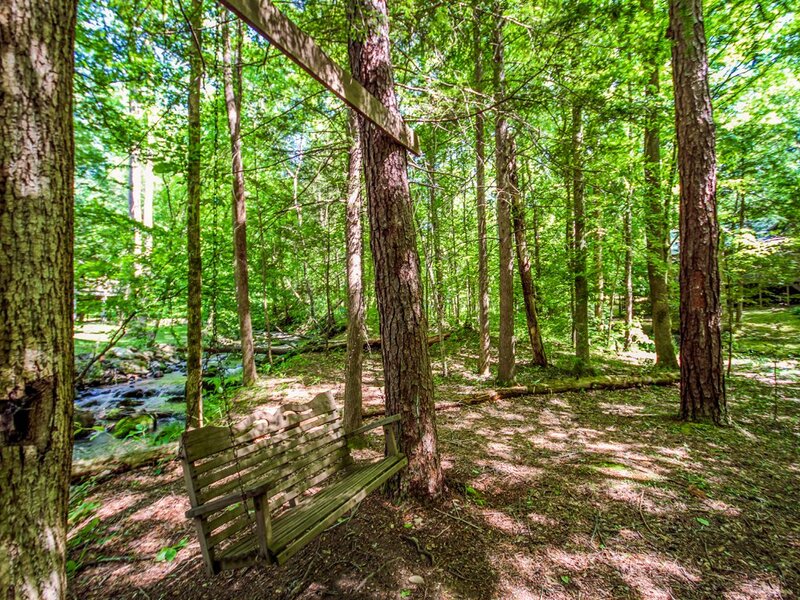 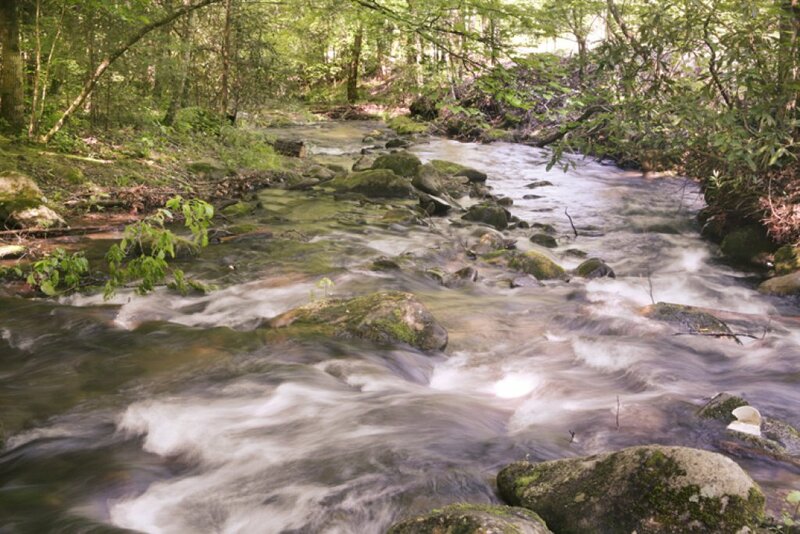 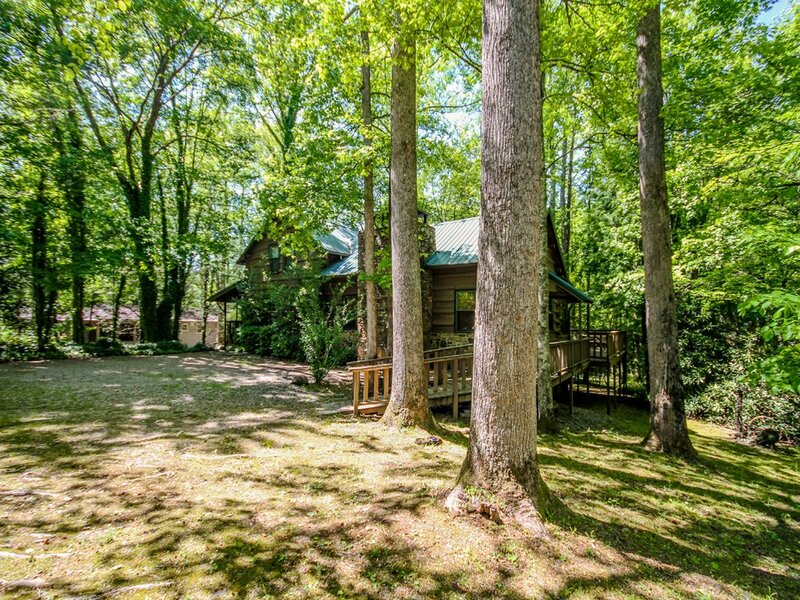 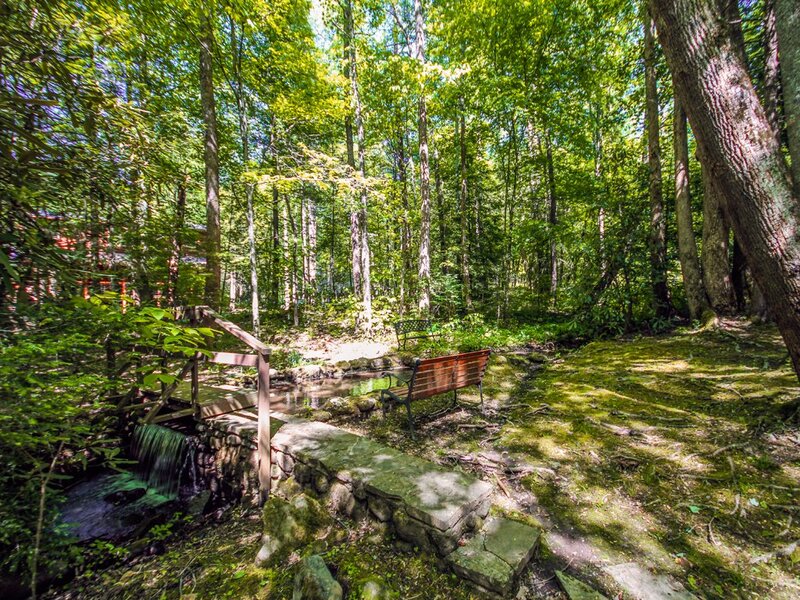 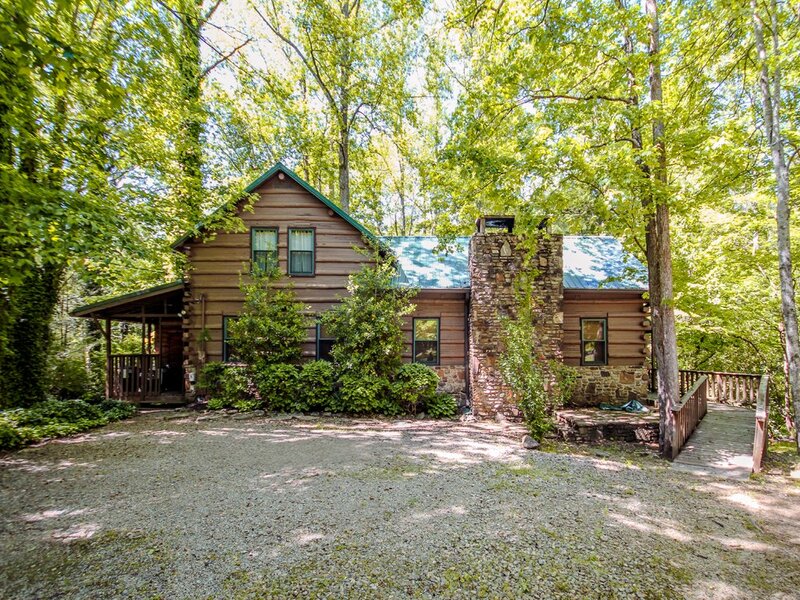 Originally located in the Great Smoky Mountains National Park, Twin Creeks is now nestled in the woods, flanked by the two creeks that give the home its name. 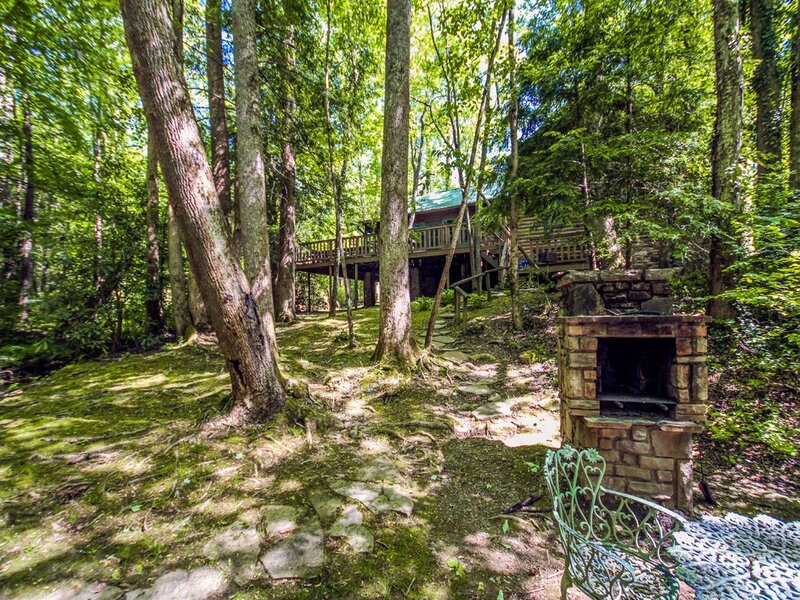 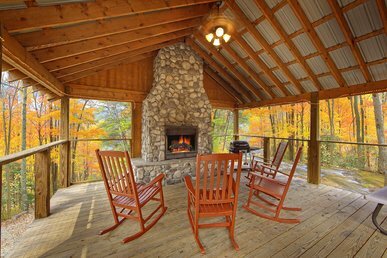 You’ll fall in love with the cabin even before you step foot inside, thanks to its storybook setting: a bridge over one of the brooks; built-in benches, a picnic pavilion, and even a swing among the towering trees; a hand-built brick fire pit alongside a charming bistro table. 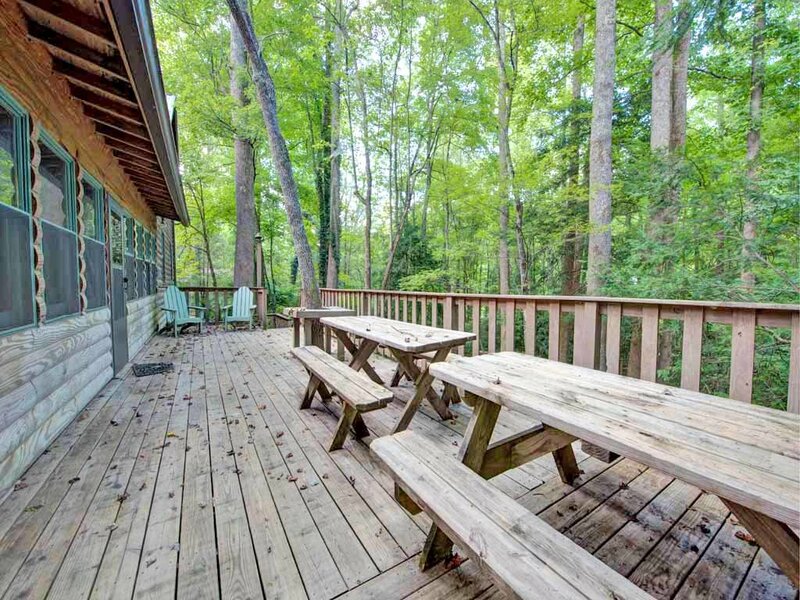 Then there’s the deck that wraps around two sides of Twin Creeks. 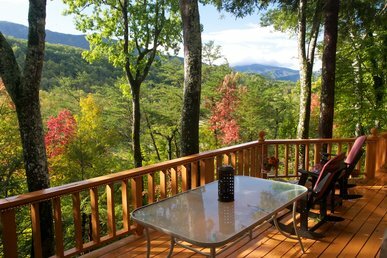 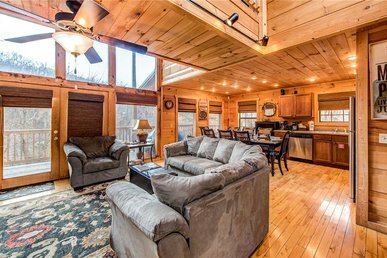 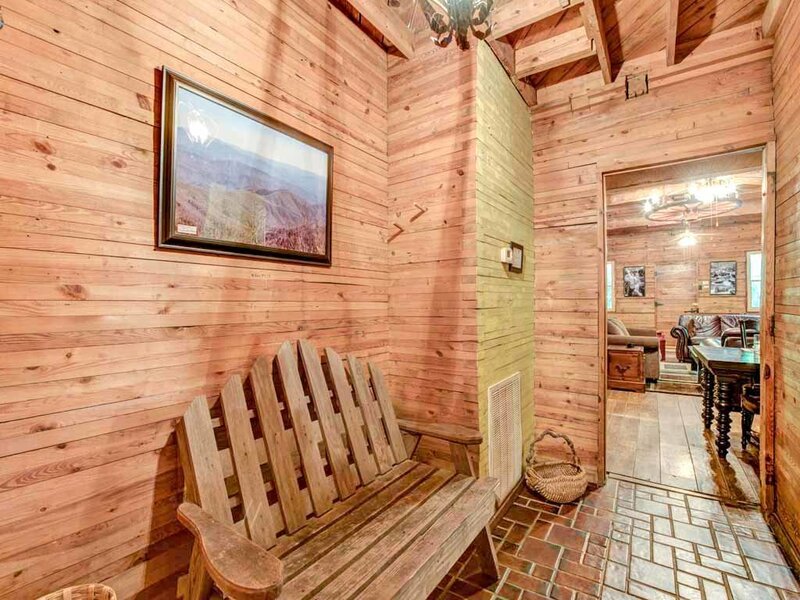 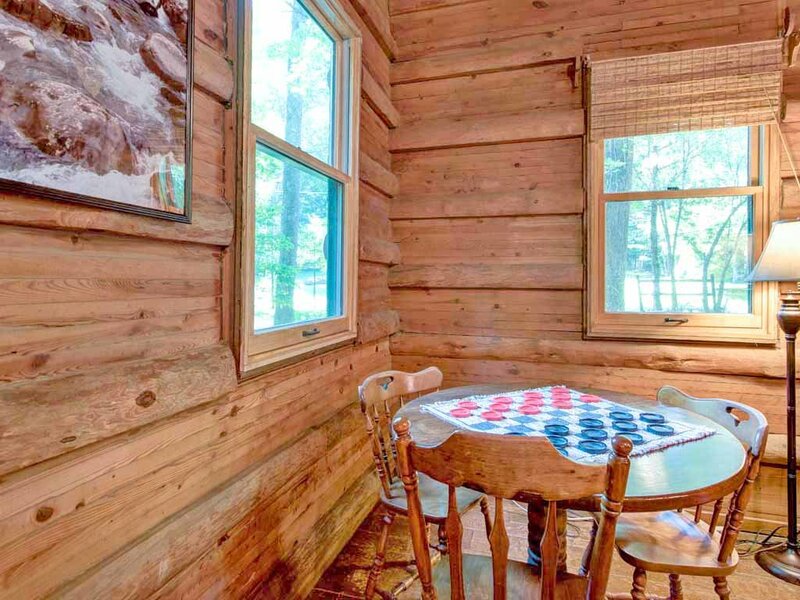 It’s furnished with rockers (a must for any mountain cabin) and two large picnic tables so that you can enjoy your meals in the fresh air and sunshine. 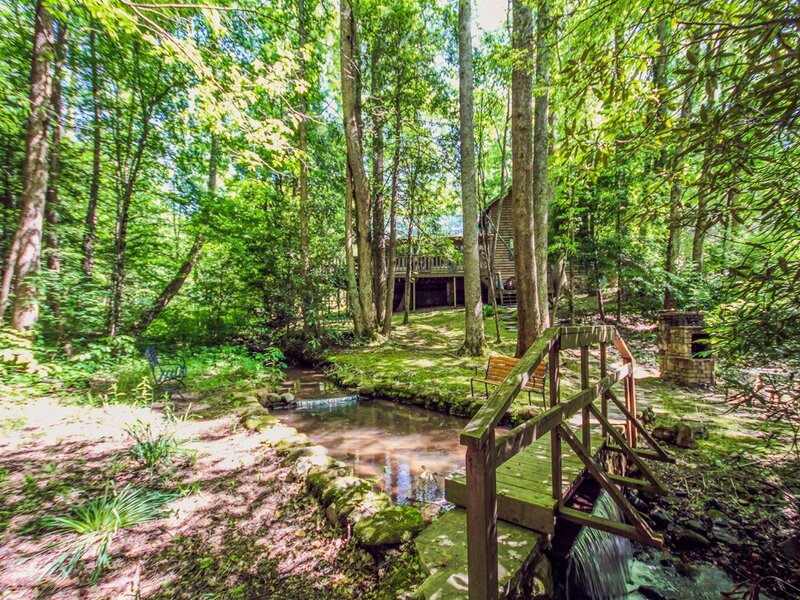 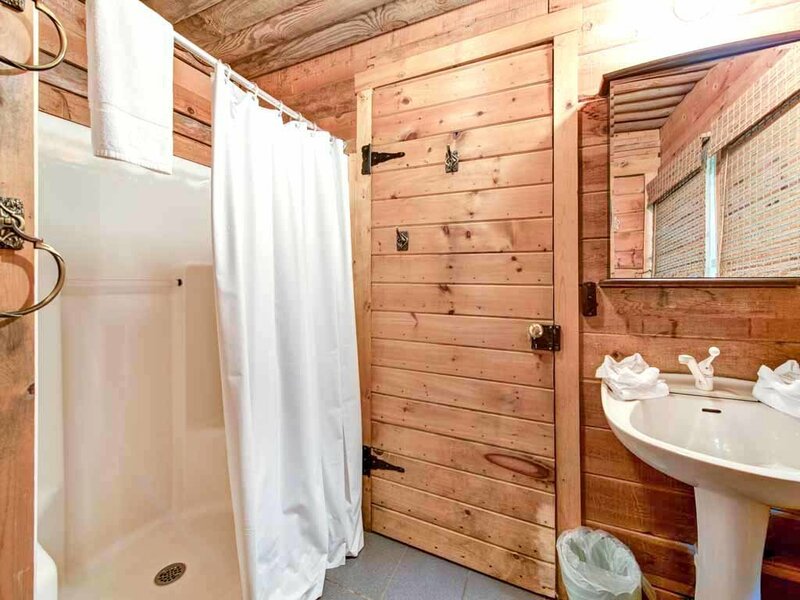 It even has a hot tub, which might be the most luxurious spot from which to listen to the warblers in the morning and the whip-poor-wills at night. 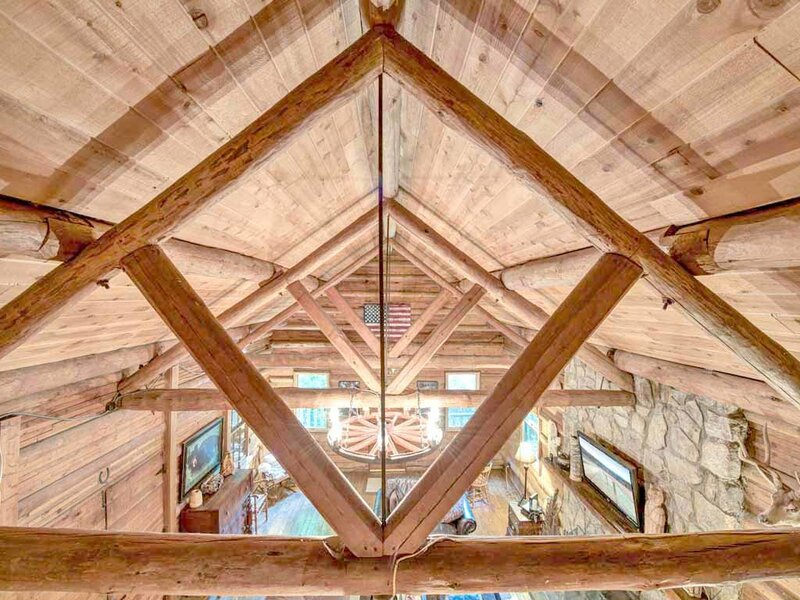 Inside, the main level’s spacious great room complements its planked walls, cathedral ceiling, and stone-surround wood-burning fireplace with furnishings that are as comfortable as they are handsome. 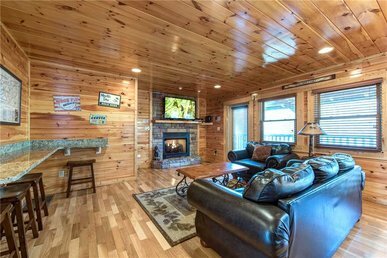 The three sofas enable everyone to gather together to watch a movie on the 42” flat-panel HDTV with cable. 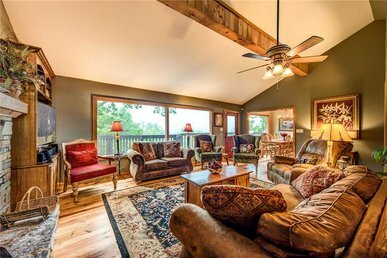 One couch even opens into a bed for two, enabling Twin Creeks to sleep as many as fourteen people—and a dog or two as well. 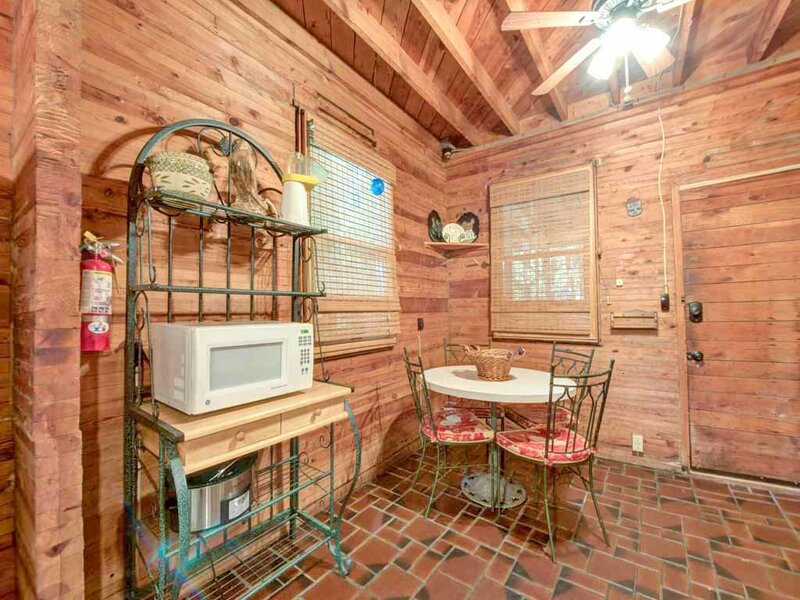 Yes, this historic home is pet-friendly! 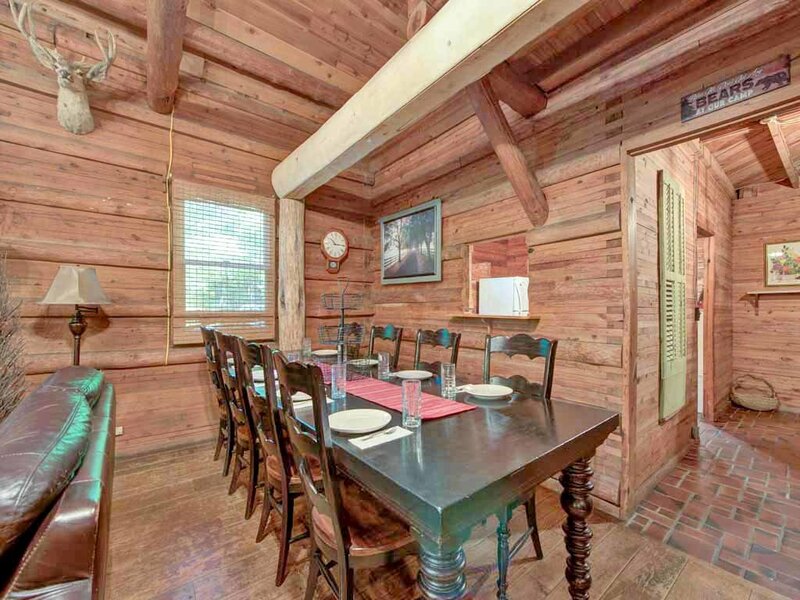 The dining table can seat up to ten people comfortably, and there are also nooks throughout the space should you want to enjoy some quiet time reading, surfing the web, or having a one-on-one chat or game of checkers. 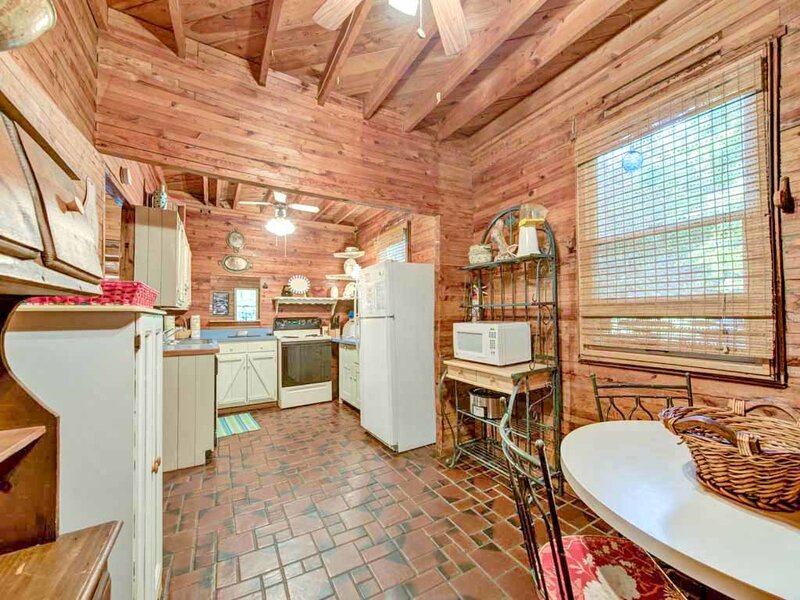 The kitchen includes all your modern appliances, from refrigerator/freezer to microwave to dishwasher, plus all the gadgets, cookware, and dishware you’ll need, whether you’re hosting a holiday bash or just want to pop some corn for movie night. 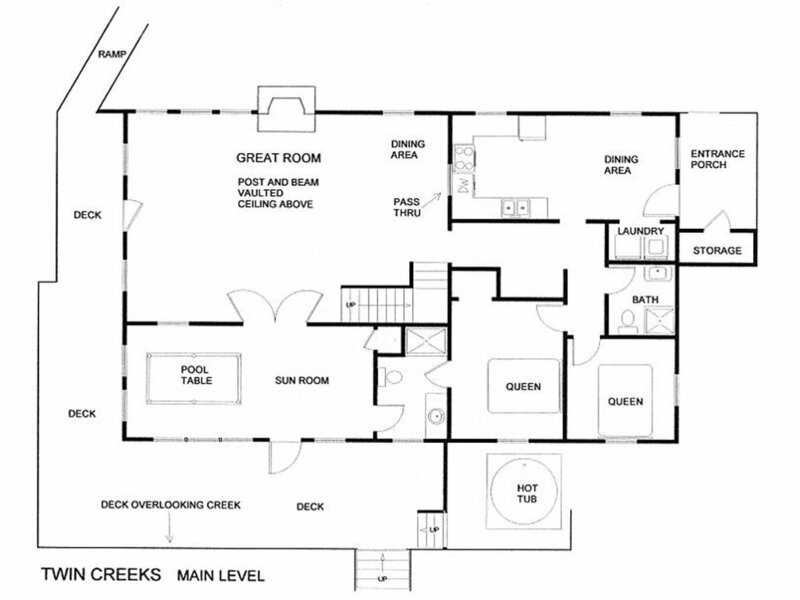 Just off the great room is the sunroom. 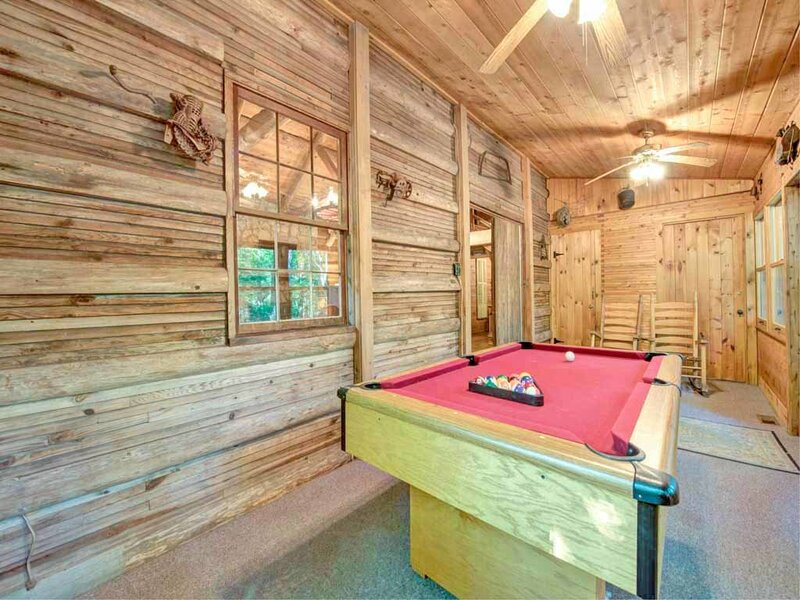 Along with rocking chairs and ceiling fans, the room includes a full-size billiard table. 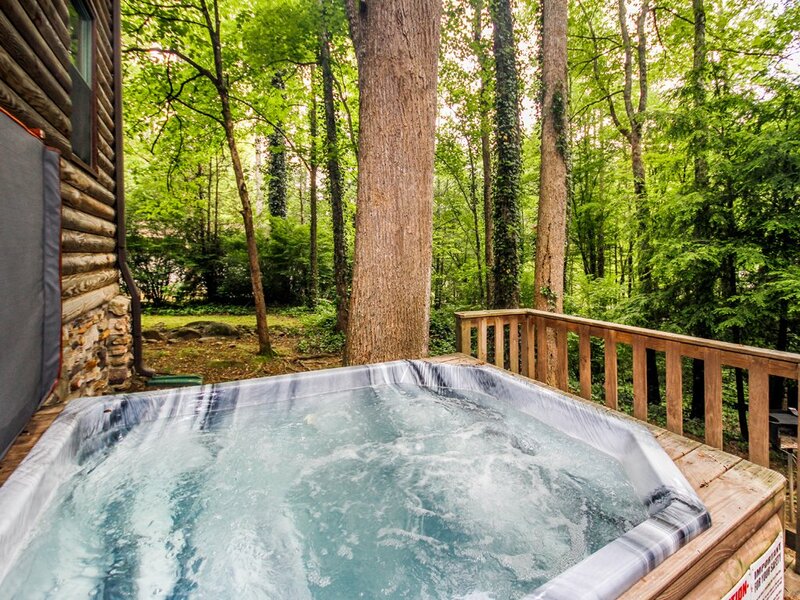 If the competition grows too intense, you can step right out onto the deck for a breather… or for a soak in the hot tub! 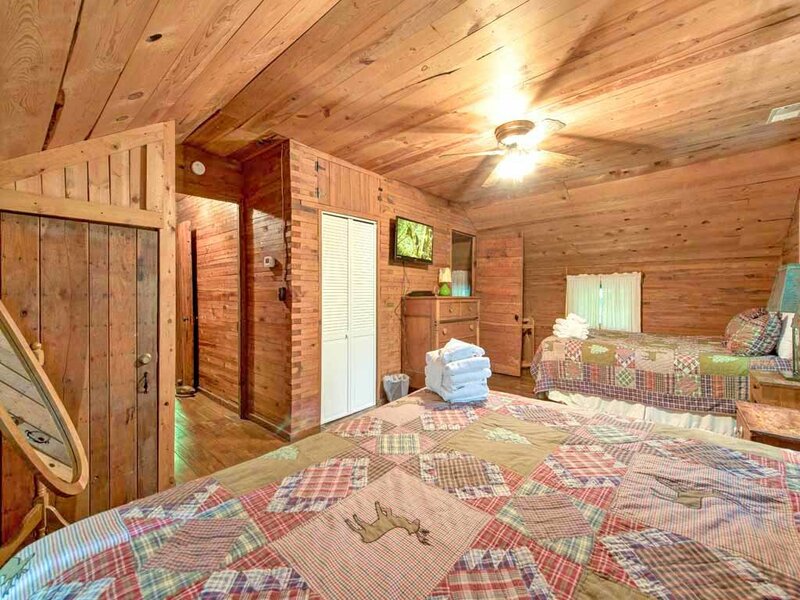 The main floor includes two bedrooms and two bathrooms. 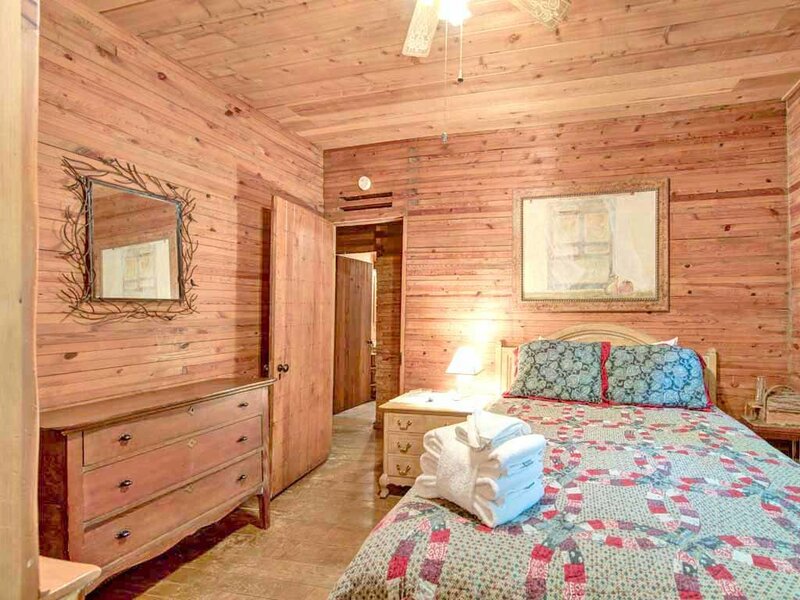 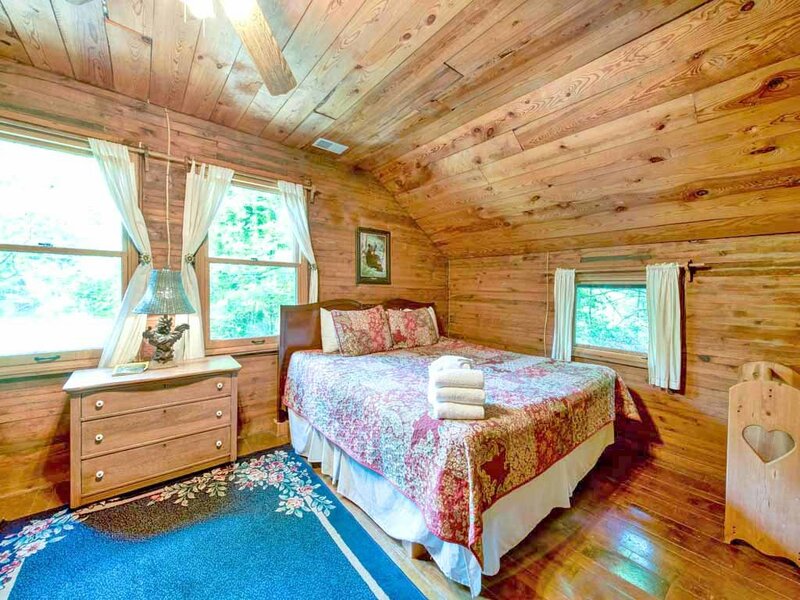 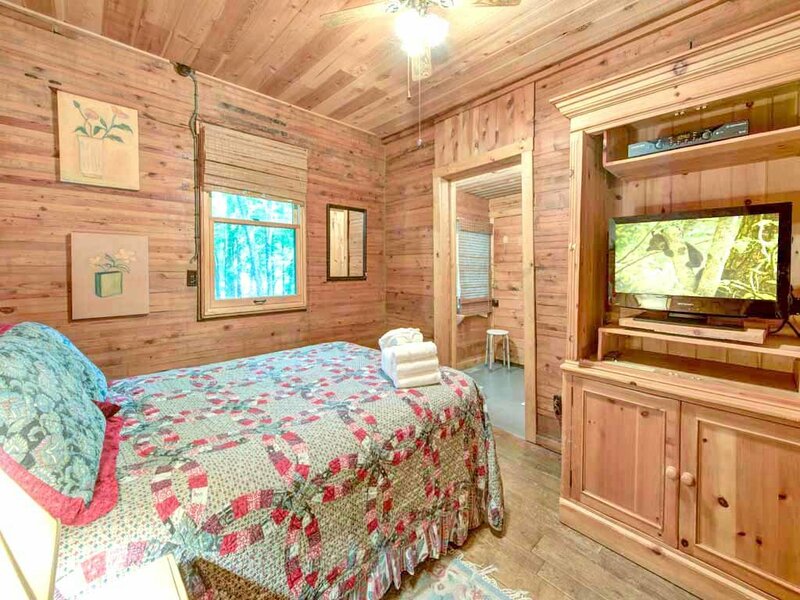 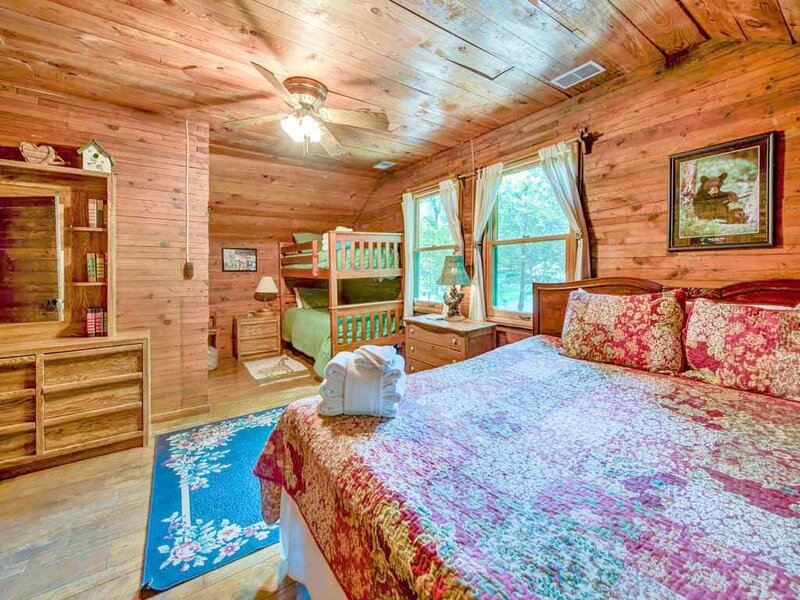 Each bedroom includes a so-inviting queen-size bed, a ceiling fan whose gentle breeze is certain to lull you to sleep, and exactly the sort of furnishings you’d expect in a vintage log cabin. 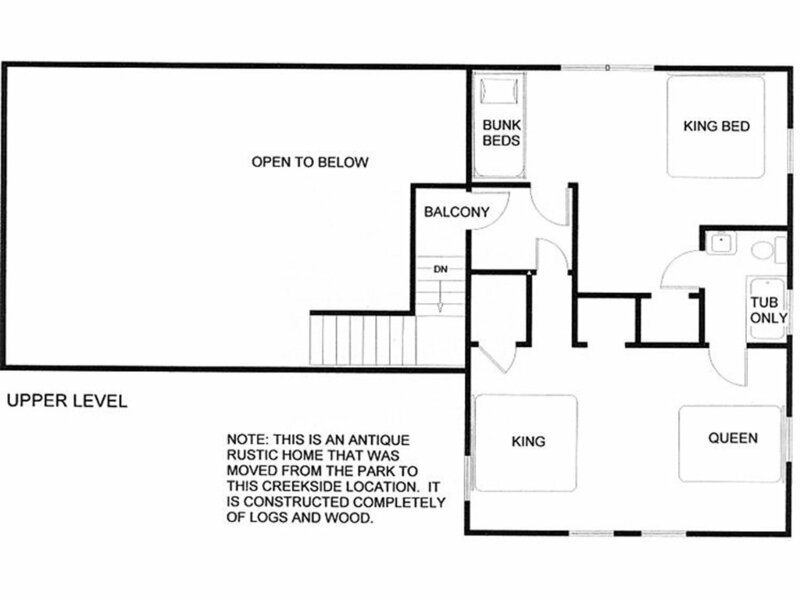 Upstairs are the other two bedrooms and a third bathroom. 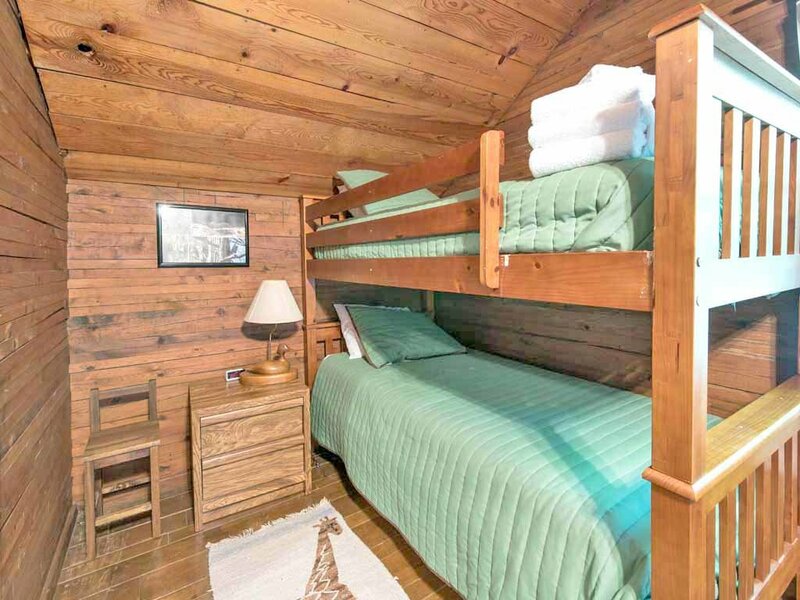 Each bedroom can accommodate a small family in and of itself: One room has a king-size bed with twin bunk beds nestled in a nook, while the other has both a king-size and a queen-size bed. 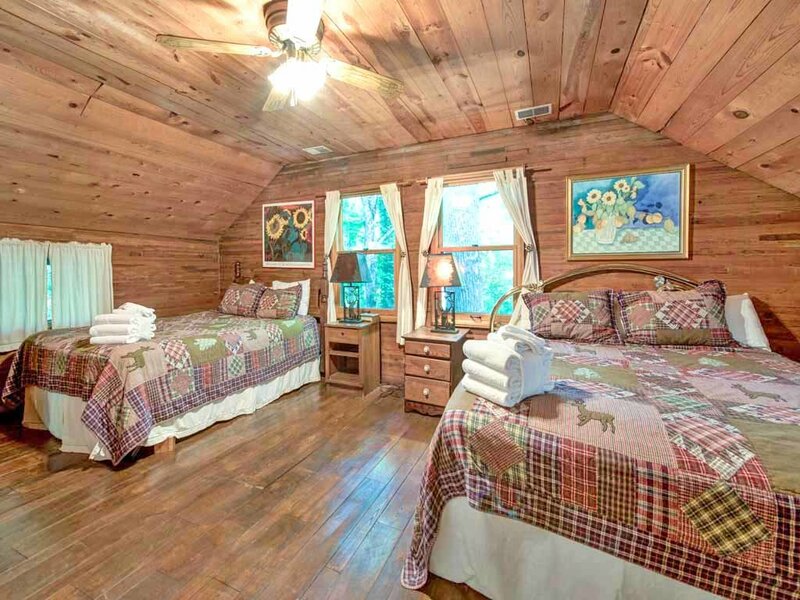 Both rooms offer an impressive amount of space, as well as plentiful storage, ceiling fans, and stunning views that will make you feel as if you’re in a treehouse. 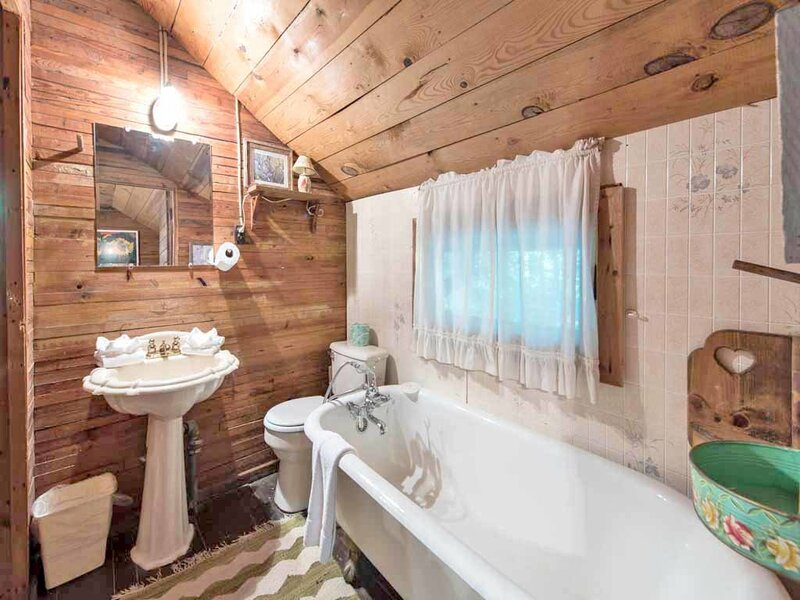 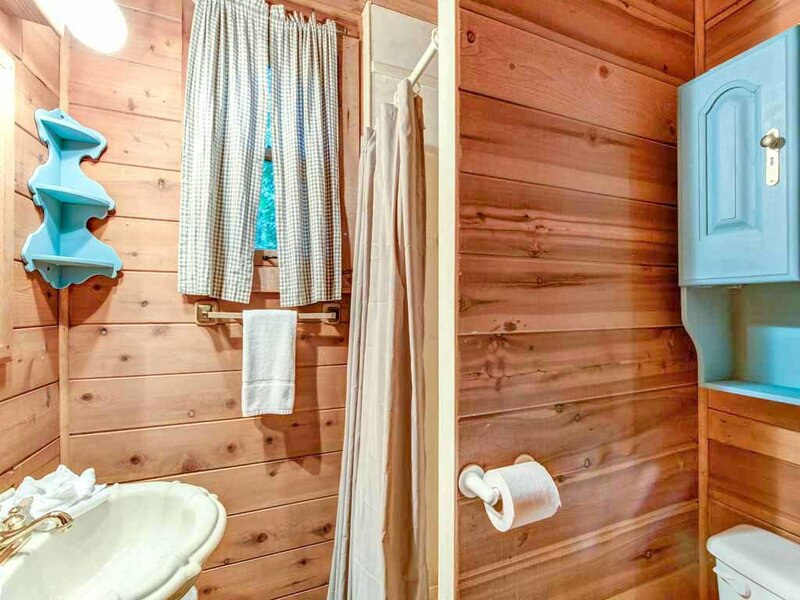 The third bathroom, in keeping with the cabin’s heritage, lacks a shower but does have a large claw-foot tub you’ll relish soaking in. 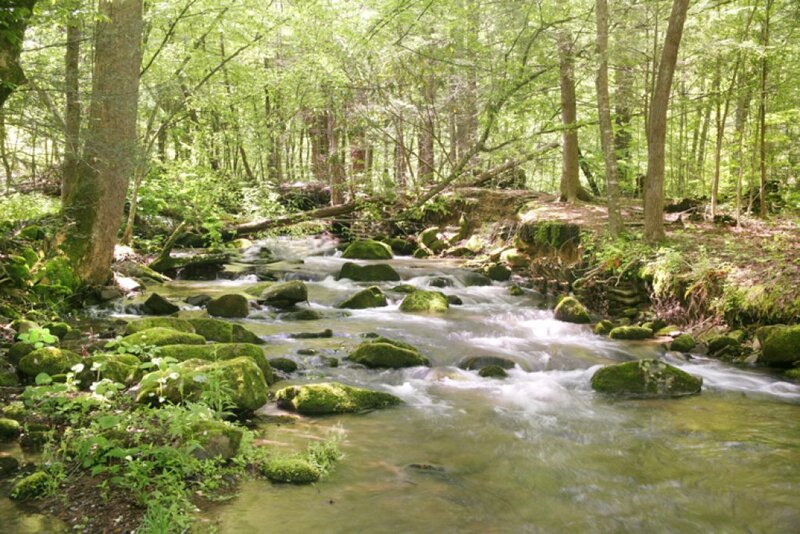 Twin Creeks’ somewhat off-the-beaten-path location offers plenty of serenity and quiet, but it’s not so far removed that you can’t easily get to all the local attractions. 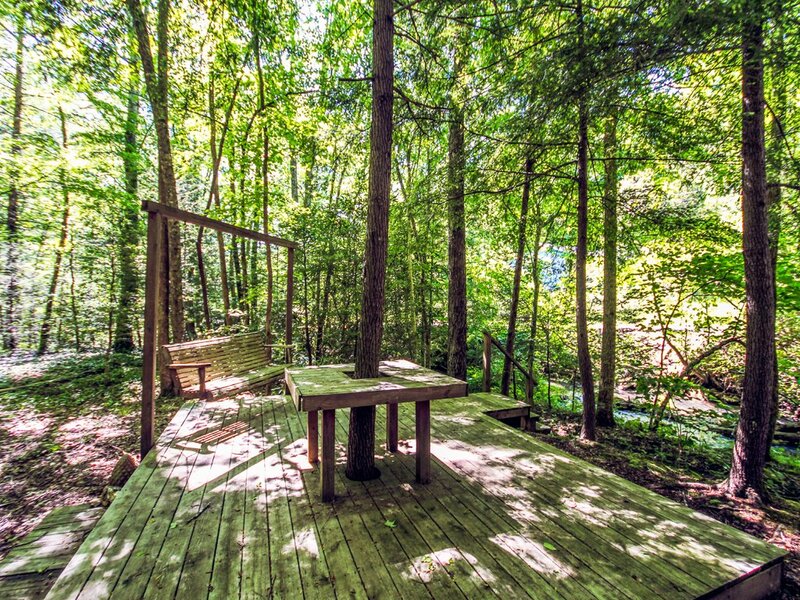 CLIMB Works, with its zip-line course and mountain-bike trail, is less than a mile away. 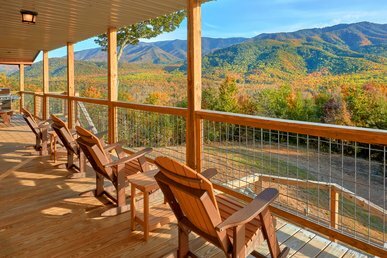 You can drive to the Great Smoky Mountains National Park in just ten minutes; once there you can hike, bike, ride horses, or take an auto tour. 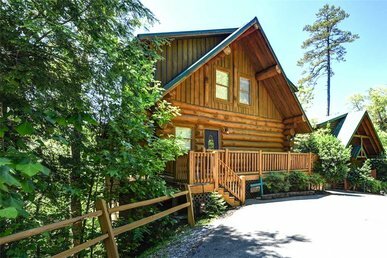 The restaurants and amusements of downtown Gatlinburg are just slight farther afield. 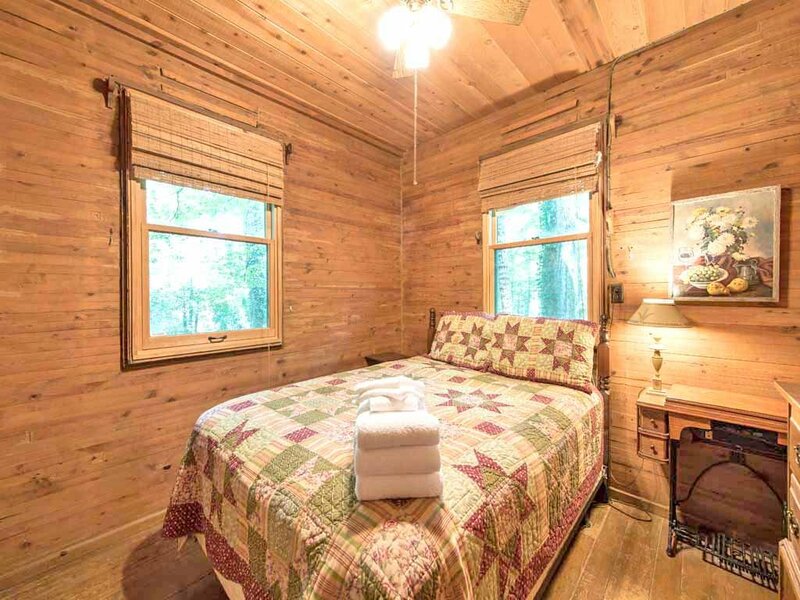 Then again, once you arrive at Twin Creeks, you may want to spend most of your time in and around the cabin—it really is that special! 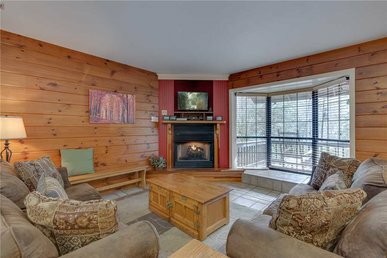 See for yourself; book your stay today.